Pre-Anabolic Strength, Energy, & Endurance! Pre-Anabolic Strength, Energy, & Endurance!Pre-Anabolic Strength, Energy, & Endurance! That’s what you’ll find in Primeval Labs newest line of Pre-Workouts. With three different formulas you can develop your ideal mix to hit new heights in whatever type of training you invest in. 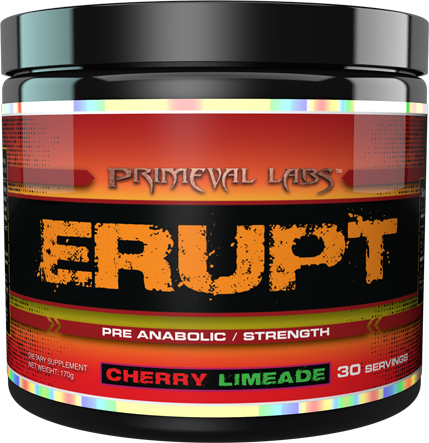 ERUPT – Give yourself an anabolic boost with the strength and power of Erupt’s muscle building formula. Achieve your goals faster than ever with increased protein synthesis and healthy mitochondrial energy. 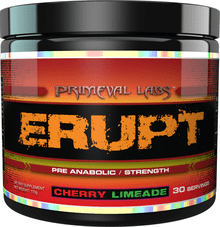 Erupt utilizes Creatine– a well-known muscle building supplement in the fitness industry. Creatine enhances your strength, especially for quick, explosive lifts. Creatine also increases aerobic capacity and speeds muscle recovery. Creatine comes in many forms – it’s the Creatine HCL that you’ll find in the Erupt formula which has the best absorption rate compared to other forms of creatine. Erupts also contains Betaine Anhydrous. This compound has proven itself in research to increase muscle mass while at the same time reducing bodyfat. Along with that is ElevATP – a patent-pending formula that stimulates the production of ATP to provide energy to the mitochondria of the cells, only further expanding your workout endurance. Add Erupt to our other pre-workouts, Adrenal Rush and Engorge, to achieve optimal results and surpass your goals faster than ever! Energy, Strength and Endurance. Energy, Strength and Endurance. Erupts also contains Betaine Anhydrous. Erupts also contains Betaine Anhydrous.